When it comes to your dental practice a thorough review of your business needs and exposures is crucial to procuring adequate insurance coverage. A comprehensive commercial insurance program will provide you with the protection that you need. Why Use an Insurance Checklist? An insurance checklist is an extremely useful tool for reviewing your existing insurance policies. It can serve as a basis for explaining and outlining your current insurance plan. Checklists are designed to point out the most important coverage features and options for your professional practice. Although they are a great tool to identify these risks, they should not be relied on exclusively to purchase business insurance since no dental practice is exactly like another. 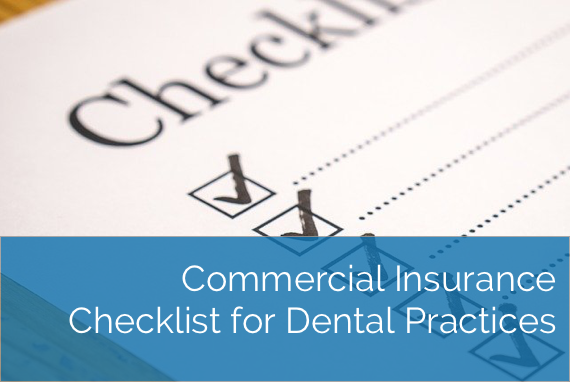 The following checklist is a quick summary of key questions (excluding professional liability) specifically geared for any type of dental practice. If you have answered No to any of the questions below it would be beneficial to request this additional coverage from your current insurance provider. Is your Property Insurance coverage All-Risk? Does your policy offer Functional Replacement Cost on dental equipment? Is Equipment Breakdown insurance included in your coverage? Does your Business Interruption policy provide Actual Loss Sustained coverage? Does your commercial insurance policy provide Sewer Back Up coverage without any cap? Does your commercial insurance policy provide Sexual Abuse/Molestation Liability? Has your current insurer waived the aggregate liability limit on your Commercial General Liability policy? Is Cyber Liability covered under your commercial insurance policy? Do you have Data Restoration coverage? Do you have automatic renovation coverage on your policy after you have purchased or have leased a new building? Does your current business interruption policy offer Mortgage Rate Guarantee protection? Is there an automatic Addition Insured Endorsement included on your policy? Does your policy include Hired and Non-Owned Auto Liability coverage? Is Libel and Slander liability included under your insurance policy? Does your policy automatically include a Liability insurance limit of $5,000,000?